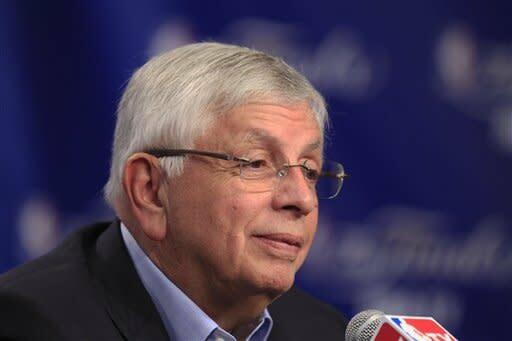 David Stern will step down as NBA commissioner on Feb. 1, 2014. Deputy commissioner Adam Silver will replace Stern. Stern sent an email to key NBA executives that he's retiring, and that the Board of Governors has picked Silver to replace him. "The Board has selected Adam Silver to succeed me as NBA Commissioner, and I am very pleased with their choice," Stern said in the email. "As you know, Adam is a world-class business executive who has influenced so many areas of our business during his 20-year tenure with the league, from television, to digital, to international, to merchandising, to sponsorships, to team business, to, of course, labor negotiations. I know that the organization will be in very good hands when Adam becomes Commissioner. "What we have achieved together and will continue to achieve is extraordinary – and we will have 15 months to talk about it." Stern, 70, became NBA commissioner on Feb. 1, 1984. His resignation date will mark his 30th anniversary leading the league. Stern later made the announcement official at a news conference.